. 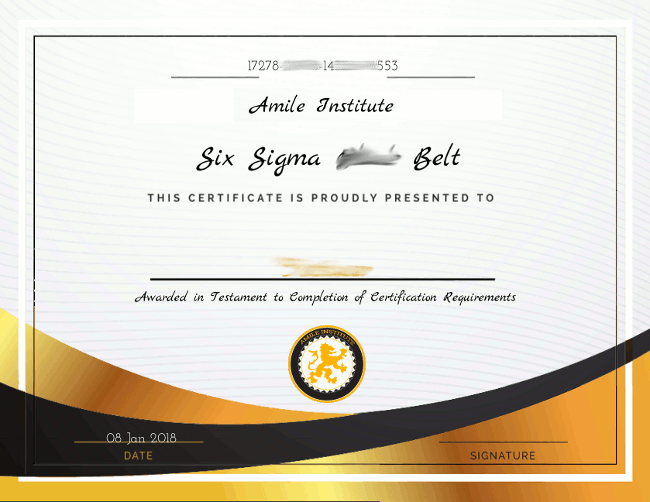 : Amile Institute - online six sigma, scrum, iso certification :. My Six Sigma Black Belt allowed me to get a new project and a pay grade increase. Thank you Amile for making this happen! I did the White, Yellow and Green belt courses on Amile and was promoted to 'VP Training'. Fantastic!! It only took me 20 minutes to finish my White Belt back in college, but that boosted my CV a lot! I got 15 campus offers. No delays. Just 3-steps to get your certification. You get 3 attempts to clear the simple online tests. Give the exam wherever you wish, no exam centres. Our certifications are valid world wide. Certificate validity can be checked in seconds.